Looking back on my childhood,when America was not so “multi-cultural”, I wished my parents had named me Farah, like Farah Fawcett or Farah Diba, or Sara, like Sara Lee (as in “nobody bakes like…”), you know, something both my American classmates and non-American relatives could relate to. You would think the name Shireen would be relatively easy for most Americans to pronounce. Well, after 24 years, I can testify that it is indeed not easy. I don&apos;t want to be melodramatic, but a name is so central to one&apos;s identity, and to have it repeatedly mispronounced or mistaken for another name altogether is a real drag. In addition to enduring the routine mispronounciation of my name, when a teacher, classmate, neighbor, or family acquaintance did in fact manage to catch the correct spelling of my name (for which I was very grateful) usually, the topic of its origin would come up. 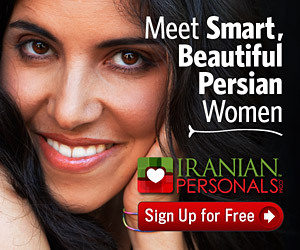 For some reason, simply stating that Shireen is a Persian name did not satisfy most inquisitors. Mostly, I would hear things like, “Persia — isn&apos;t that in the Middle East?” “Iran,” I would answer. Then the eyebrows would furrow into the “YIKES — Iran as in Iran hostage crisis, as in Ayatollah-Iran-Khomeini?” position, and the conversation would end abruptly. By the time I reached fourth or fifth-grade, I think I had internalized these and other similar encounters — the confused looks on peoples faces when I first pronounced my name, the failed attempts to correct them, the resignation and despair I felt at being called Sherry, Shirley, Sharon, Shyreen, or Siren. My younger brother, Nisar, had undergone the same experience with his name, which was often mispronounced as “NEE-SORE, NICER, or NISSAN”. GI Joe: “Thanks for the lift. What&apos;s your name? I would complain to my parents about my misery. I begged them to change my name to Jennifer, or Sara, even Norma. All my friends had easy-to-pronounce, cool names like Ashley, Rebecca, Christina, or Danielle.They would even wear their names with pride on gold-plated and rhinestone-studded necklace charms. “What are you complaining about?” my mother would ask me. “We ALL have to face that. Besides your name means &apos;sweet&apos;, and it is also connected with a wonderful love story, Shireen and Farhad.” She would then go on to tell me the legend and how Farhad died, consumed by his perfect and selfless love for the beautiful Shireen. (At the time, I wondered if either Ken or GI Joe would die for Jennifer Beach-Time-Barbie. Probably not). Of course my mother&apos;s chats provided me with little comfort at the time. I felt like I was an awkward birch tree growing up in a forest of pines. Everything was different about me — my hair color, my skin, my religion, and, of course, my name. It was not until my sophomore year of high school, when we were discussing Shakespeare&apos;s “Romeo and Juliet” in literature class that I came to appreciate my name, and with it the value of my identity and heritage. My high school English teacher was very much a wordsmith and a linguist, and had learned some Persian while in college. Needless to say, I felt a warm wave of pride sweep over me as the class repeated my name several times in high tones, enjoying the mellifluence of its consonants and vowels. Now, if I could only find a legend for Nisar!